At Ryan Koch Homes, we'd like to help you explore Madison, Wisconsin's wide variety of housing options, and today, we're proud to introduce you to the gorgeous Wyndemere Condos! The Wyndemere Condominiums are a small community of townhomes, with only 50 units and an excellent reputation. Located in a lovely neighborhood on the west side of Madison, Wisconsin, these sought-after townhomes are just a short walk from gorgeous Everglade and Woodland Hills parks, and near the expansive Owen Park. Close to biking and walking trails, the neighborhood is serene and residential, yet only minutes from the beltline and premiere west-side shopping and great variety of restaurants. 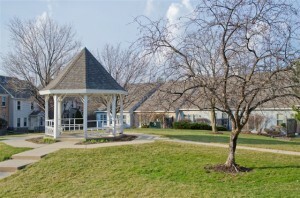 The quiet Wyndemere community lies within the Madison Metropolitan School District, including Crestwood Elementary School, Jefferson Middle School, and Memorial High School, which has been honored as a “National School of Excellence,” and was awarded a Smaller Learning Communities Grant in 2001. Available bus lines offer convenient service to UW hospital, downtown, and West Towne Mall area. JUST LISTED! At $179,900 this gorgeous Wyndemere condo is PRICED TO SELL! (Open House on 4/22) This expansive 2 bedroom 2.5 bath home offers 1780 feet of living space. The welcoming, private front entrance features lush exterior brick and stone touches. The charming foyer has wood floors and opens into the large living room, bathed in natural light from its beautiful bay window. This cozy space boasts plush carpeting, crown molding, and wood-burning fireplace with brick hearth and gorgeous mantle. The bright and recently updated kitchen features stainless steel appliances, granite counters, and maple cabinetry, with a dining area that opens out to a large, private deck. The very spacious master bedroom is a must-see, with floor-to-ceiling windows, and bright master bath featuring dual vanities and tile floors. Enjoy painted wood-trim and custom window treatments throughout the home, as well as in-home laundry. 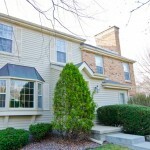 This Wyndemere condo includes a lovely finished basement with extra storage space, and a private 2 car garage. The Wyndemere condos also received new exterior siding in 2008 and a new roof in 2011. For a photo tour and additional information about the home, please click HERE. Interested in a private showing? Please contact Ryan Koch at (608) 219-9766. 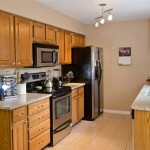 Click here to view similar condominium homes in Madison, Wisconsin.